The Royal Palace – thanks to the Royal Palace for this image. 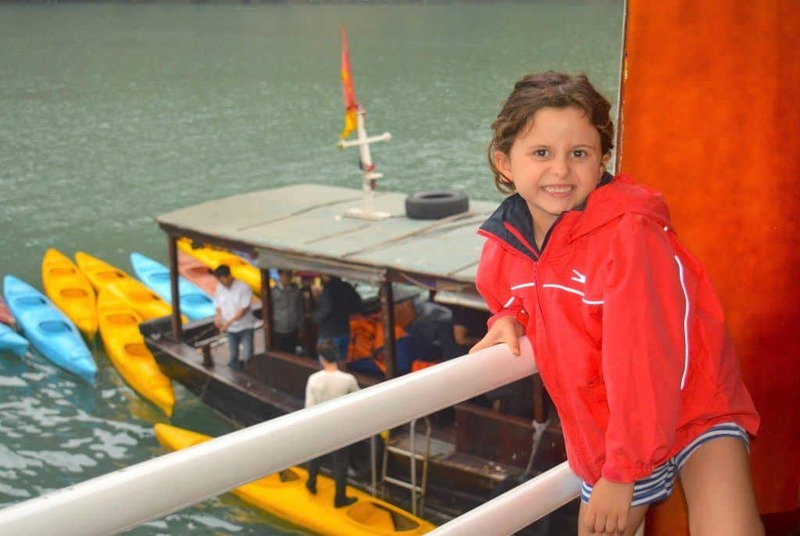 Over Christmas we took the 1 night / 2-day Royal Palace cruise on Halong Bay. I choose the Royal Palace cruise after a lot of research on TripAdvisor and other various travel sites. 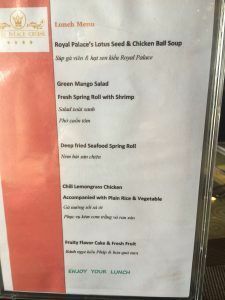 To help you choose the right cruise for you, this post will cover all the various options and provide our full review on our time on the Royal Palace cruise. Halong Bay is located in the North East of Vietnam and is a UNESCO World Heritage Site. It is well known for the thousands of spectacular limestone cliffs emerging from it’s beautiful emerald green waters which are topped with tropical rainforests. 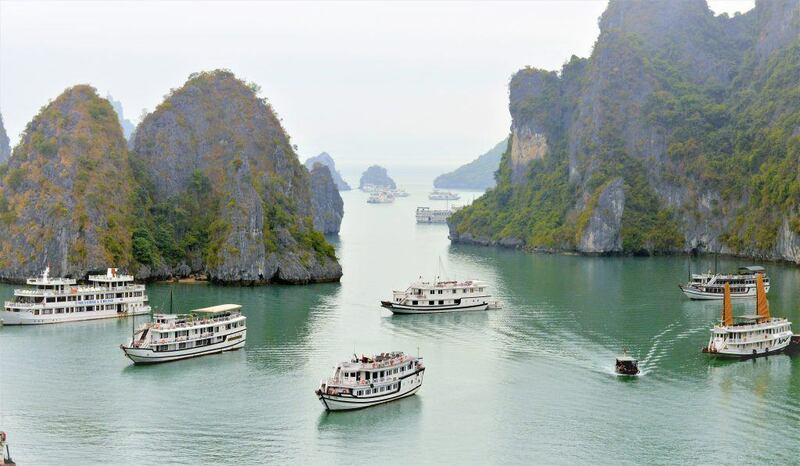 Halong Bay is often referred to by others as a tourist trap due to the hundreds of junk boats taking visitors to view its beauty each day. 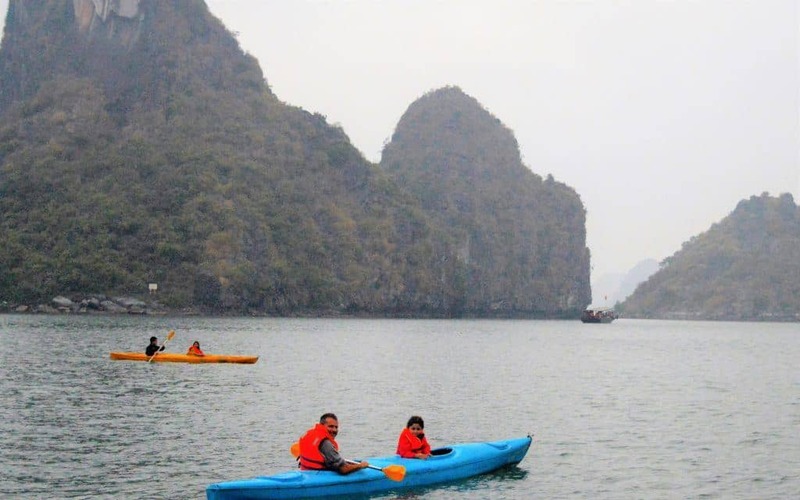 In my opinion Halong Bay is a must see for every visitor visiting Vietnam. Yeah sure there are quite a few boats in the bay, but I certainly would not say its crowded and in my opinion the number of boats in the bay do not impact one’s experience at all. 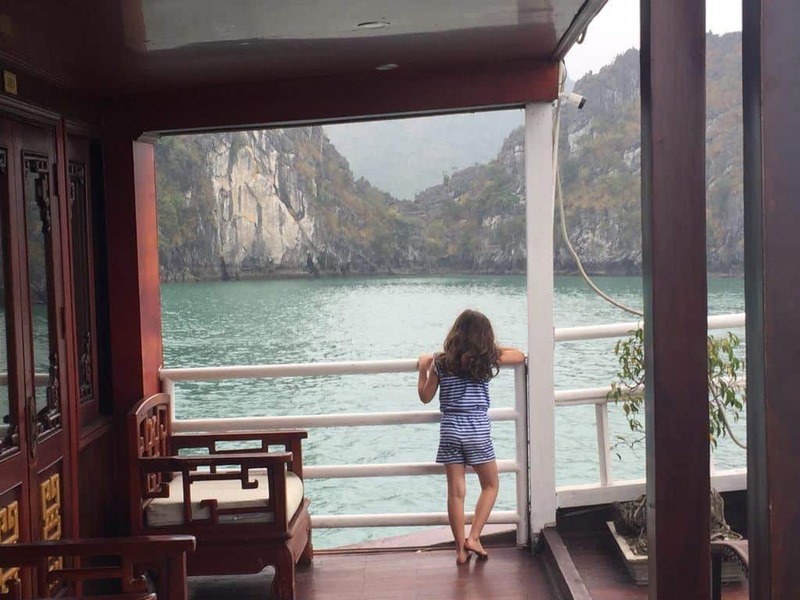 Whilst it would be amazing to have Halong Bay all to yourself, this is just not possible and so I recommend sharing it with other tourists rather than miss out on it altogether. 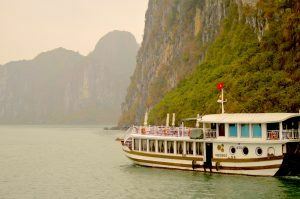 The main difference in the options of cruises available is how long the cruise is on Halong Bay and how much it costs. Half Day: For those strapped for time there is a half day cruise. 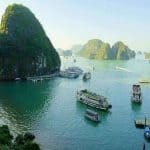 Whilst this cruise is better than nothing, just remember it is a 4 hour trip each way from Hanoi to Halong and back again– so this makes for a very long day. 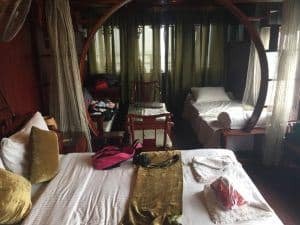 I still think this gives you a great experience in Halong Bay and well worth it if you simply don’t have the time to stay overnight. Overnight – the most popular cruise option is to go overnight. The other option is to go for 2 nights. 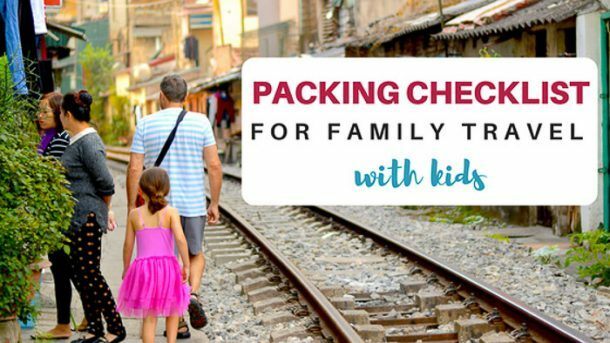 Which option is best, really depends upon how much time you have and probably the time of year you visit. I originally booked 2 nights in Halong Bay, but later changed this to 1 night. I have been to Halong Bay before and spent 1 night. My first visit was during summer and it was warm enough for lots of swimming and sunbathing. During that visit I found 1 night not enough time. Our latest visit was during winter and I had read that the weather would not be suitable for swimming and in fact likely to be raining and cold. 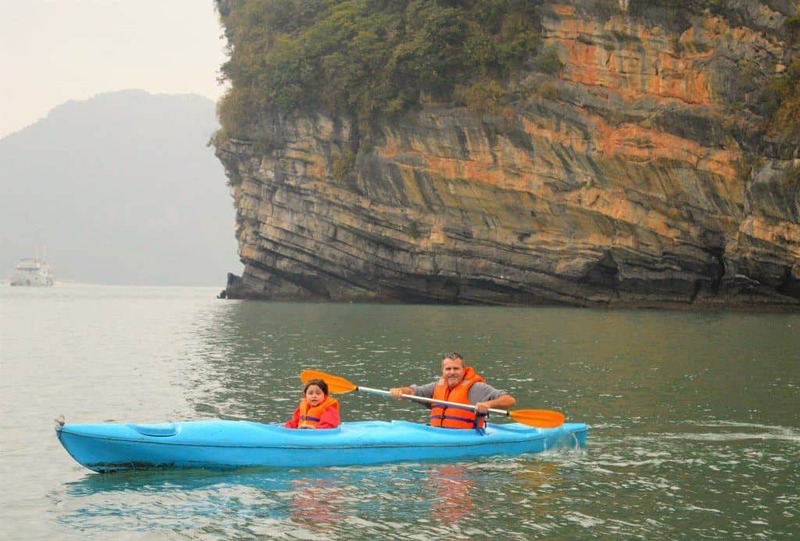 On that basis I decided to reduce our time on Halong Bay to just 1 night. During our recent visit it certainly was not warm enough for swimming and sunbathing, but it certainly was not cold. In fact, during the excursion we did on one of the islands, it was still quite hot walking around. I could have easily stayed on the boat longer, I found it so relaxing just sitting there watching the beautiful limestone cliffs go by. However, I am unsure whether Myla would have handled another day confined to a boat. 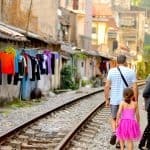 So it is really a personal choice as to how long you visit Halong Bay for, it really doesn’t matter – just make sure you do. Boats are generally categorised as budget, mid-range or luxury and the most popular option is mid-range. Prices vary significantly so make sure you look around and see what each cruise actually includes. It’s really a matter of making sure the price is right for you, checking what they include in the price and checking out other tourists reviews. 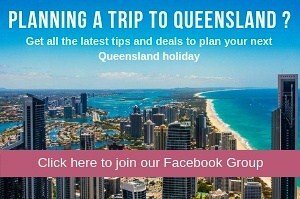 There are several ways to book your cruise but I recommend booking with booking.com as you won’t have to pay a deposit and you have the option of cancelling if you change your mind or find a better deal elsewhere later. We decided on the Royal Palace cruise – which is a 4 star / mid range boat. It is a mid size boat with 14 cabins. We booked a family room which cost $530 AUD on the Royal Palace cruise via booking.com. You can usually book this room at a much cheaper price, however given we booked over Christmas the price was a little more expensive. You can book the Royal Palace cruise on booking.com via this link. The cruise operators arrange transport to pick you up from your hotel in Hanoi. 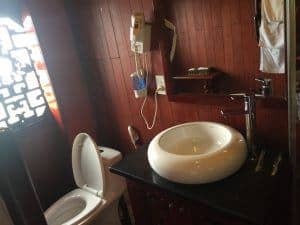 Upon booking the Royal Palace cruise we were sent an email detailing the options of getting to Halong Bay which included shuttle bus or private car. We choose the shuttle bus and it cost an additional $5 US per person. Some cruises include transportation but most do not. We were picked up at our hotel at around 8.30 AM. Jackie, the young man who picked us up was very friendly and helpful, assisting Myla cross the busy street, whilst Andy and I took care of our bags. The bus was fairly full when we got in but we had a few more pick-ups before we left Hanoi. 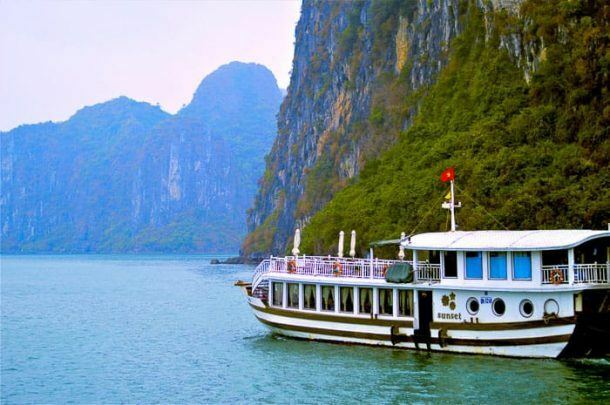 The trip to Halong Bay takes 4 hours and includes 1 stop along the way at a café. The cafe stop was at 11 am and had toilets, a cafe, snacks and souvenirs. I recommend either bringing some snacks with you from Hanoi or grab something to eat at the café stop as you won’t be eating lunch until around 1.30 pm. We arrived at Halong Bay wharf at 1 pm and it was packed! Each boat has its own dedicated wharf area, and with hundreds of boats, the area is huge. As soon as the cruise boats come in everyone gets off and new passengers get on – so there are people coming and going everywhere. 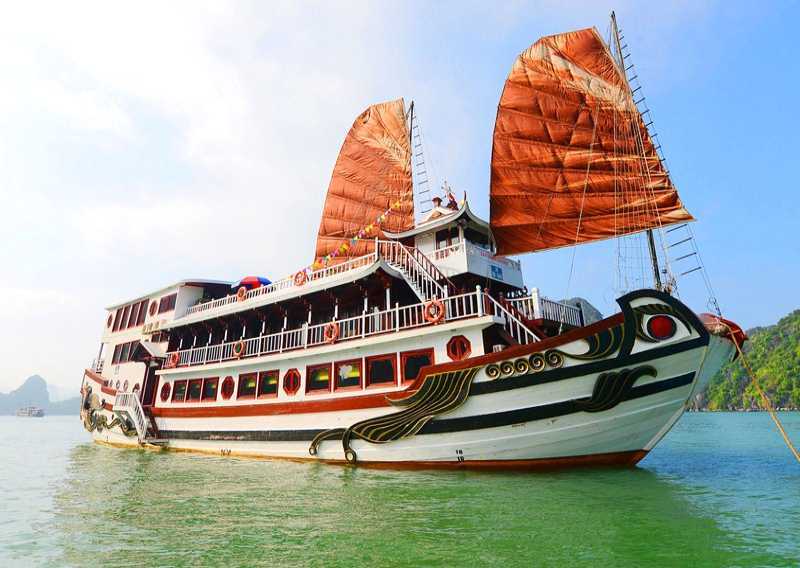 With hundreds of boats visiting Halong Bay each day you can imagine how chaotic it is. Upon arrival the guide on the bus asked us to stay seated. Soon he returned with a new guide who introduced himself as David our guide for the Royal Palace cruise. David then guided us from the bus down to the wharf. 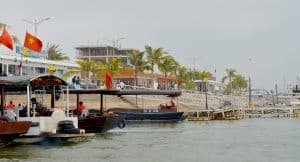 We waited at the wharf for a few minutes and we were then escorted into a smaller boat and were assisted with putting our bags onto the boat. The small boat then transported us to the Royal Palace, this took no more than a few minutes. Once we arrived at Royal Palace all the staff were waving and smiling at us arriving. We were all assisted off the boat and helped with our bags by the very friendly staff. We were showered in rose petals as we stepped on the boat– which I found slightly amusing. It was if we were royalty! Given it was Christmas Eve the boat was decorated in Christmas Decorations complete with Christmas tree. When we arrived we were super excited to be told we had been updated to the Royal Suite Room. There are only 2 of these rooms on the boat and they are the best rooms available on the boat. After 4 nights in our very basic room in Hanoi, we were all like little kids in the candy shop! The room was massive. 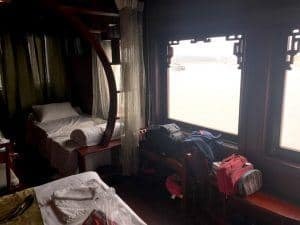 It had huge windows providing the best view of Halong Bay, a fantastic shower with hot water and even a private outdoor sitting area. None of the other rooms had private outdoor sitting areas so this was pretty awesome. The Royal Suite was on the main level, which was just behind the restaurant and bar. This was perfect as it meant no stairs to go up and down to meals and also meant easy access to the bar. Again another treat after our room in Hanoi was on the 5th floor!! Our all-time favourite thing to do was simply to sit in our private outdoor area and watch the bay go by. It was pure bliss. The food served on board was absolutely delicious and was seriously a fine dining experience. My only complaint about the food was that there was far too much of it! In the end we had to start turning down meals as we could simply not eat it all. 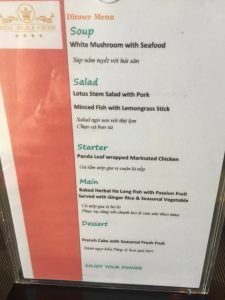 There is also a lot of seafood, so if you are not a seafood lover it would be wise to let them know upon arrival so they can provide you other food. Mind you we did not do this and yet we still could not eat all the non-seafood food. Drinks are not included. As is usually the case when you have no choice where to buy your drinks from, drinks were rather expensive compared to the mainland. We are wine drinkers and wine was hugely expensive at 900,000 VD ($54 AUD). Also the wine was absolutely terrible, so terrible in fact that we could not drink it at all and seriously I can drink some pretty bad wine! My recommendation would be, if you like wine, buy wine from the mainland at the price of 300,000 VD ($18 AUD). Water was provided free of charge in the rooms but not during meals. Lunch day 1: 1.00 pm we were served a 5 course lunch (see photo below)– it was absolutely amazing! Dinner day 1: 7 pm we were served an amazing 5 course dinner (see photo below) – but we could not eat it all and had to turn away the last few courses – we were actually still full from lunch. Breakfast day 2: served very early at 6.45 am – a buffet of fruits, toast, bacon, pastries and eggs cooked to your liking. Lunch day 2: served at 11 am – a buffet of salads, vegetables, and cold meats. There was also a great selection of delicious deserts too. At 4 pm on day 1 we were able to take out kayaks from the boat. The kayaks were two seaters so Andy took Myla out. I took the opportunity to take some great photos and enjoy some alone time. After kayaking, we were able to go swimming if we wished. It was far too cold for us; in fact, I don’t believe anyone went swimming. After dinner at approximately 8.30 pm a karaoke party was held. We were total party poopers and went to bed before it commenced – we were shattered from our big day. After dinner we were offered to go squid fishing – this is not really our thing so we sat this one out. At 6 am in the morning a Tai Chi class was held. Did someone say 6 am??? We are not one’s for getting up this early for exercise on holidays so we sat this one out. 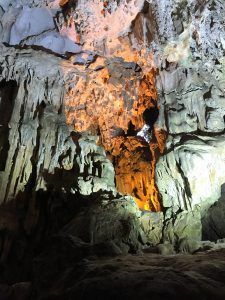 After breakfast on the second day – Christmas Day for us – we were all ferried in the smaller boat to Driftwood island where the fantastic Dau Go Cave is located. 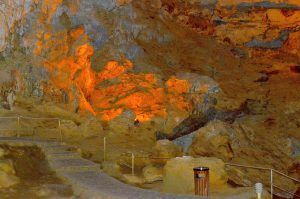 To get to the entrance of the cave you need to climb 90 steps. It is extremely steep and hard work – but the climb is well worth it. 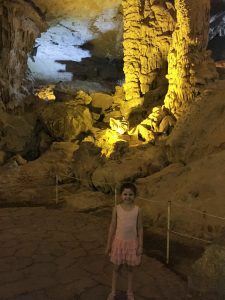 The ceiling of the cave is around 25 m high and has hundreds of stalactites falling from the roof – making it look like something from an Indiana Jones movie set rather than a natural formation. 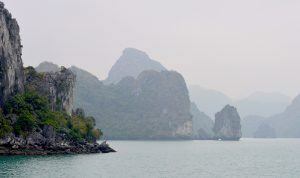 The exterior of the Cave has some spectacular views and great photo opportunities of Halong Bay. This view is what postcards and selfies are made off. Be warned though there are stacks of people lined up for this particular photo so you will need to line up and wait your turn. All up we spent probably about 45 minutes exploring the cave. Make sure you take water and lots of it as we found the stairs steep and hard work. At 10 am David our tour guide demonstrated how to make Vietnamese Spring Rolls. We arrived back at the wharf at around 12 pm. 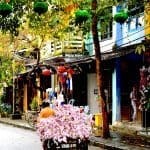 For those returning to Hanoi the same shuttle bus took you back to your hotel. We were moving onto to Ninh Binh and had arranged our own private transfers. David assisted us by calling our driver and in locating our car at the wharf. I was very thankful for this as the wharf was once again chaotic and I would have no idea how we would have located our car without his assistance. 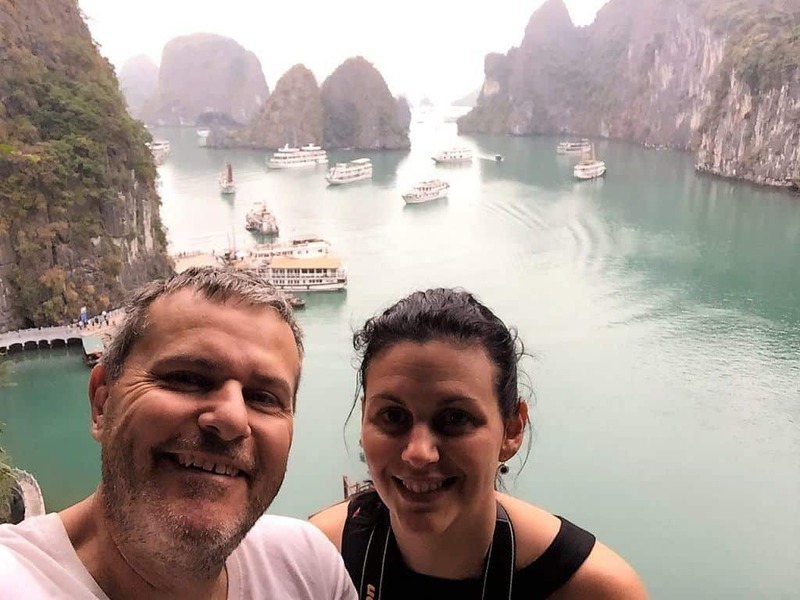 We don’t overly enjoy organised tours and being on a set schedule was not that great – but there really is no other option to see Halong Bay at a reasonable price. The other thing I was disappointed about was that you are required to check out of your room by 9.30 am despite the boat not returning to the wharf until 12.30 pm. Although I understand that the reason for this is to get the rooms ready for the next lot of passengers. Once we checked out we were required to sit on the boat for 3 hours. Luckily Myla found a few little friends and they chased each other around the boat. But they were noisy and I am unsure whether the other passengers appreciated this, so we were constantly trying to quiet them down. For those who visited Halong Bay 10 years ago like I did, one thing that is different is the fishing villages. I noticed during my research that none of the cruise boats visited the villages. I asked David our tour guide about this and he advised that the villages had been relocated to the mainland by the Government in 2014. 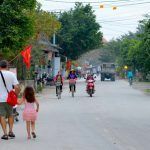 It was disappointing not to share my experiences of visiting these amazing villages set up on the water in the middle of the ocean with Andy and Myla – it had been one of my favourite parts of my cruise in 2007. Overall I enjoyed our stay on the Royal Palace cruise. The boat was exceptionally clean, the staff were amazing, it was seriously 5-star service – they couldn’t do enough for us. The staff loved playing with Myla too which assisted us in entertaining her. I would definitely recommend the Royal Palace cruise for anyone considering a cruise on Halong Bay. 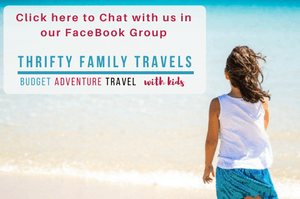 Have you visited Halong Bay? What boat did you go on? Want to keep this for later? Click on the image below and pin to Pinterest.